- Both side PP coated. - Special steel coating at the edges. - Made of strong board. Application: Eyelets for Paper Bag,Tags Files,Lever Arch Mechanism etc. 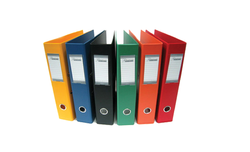 We are renowned as one of the most popular enterprises in this industry, offering a wide range of Lever Arch File. The products offered by us are available in various sizes, colors and designs as per variegated demands of our clients. These are crafted using the topmost grade basic material. We are involved in manufacturing and exporting a wide range of Lever Arch file that meets the demand of various offices worldwide. Our range is offered in various shapes, sizes and colors and can be availed at competitive prices. We also meet customized specifications. Made of Grey board encased in PVC. The double fold at the lower edge provides extra protection to the file and also protects the desks and cabinets from scratches. 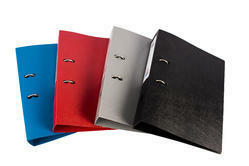 We provide Lever Arch File. - The cover sheet is made of high quality PP, with novel veins on, feels comfortable, coated with PP film, durable and water proof. The spine label is changeable, its reverse can also be used. - All cardboard are imported, level off and fast, never distort. We are a significant organization in the market, engaged in offering a huge range of Box Files. Our valuable clients can avail this file from us in a given time frame at reasonable price.